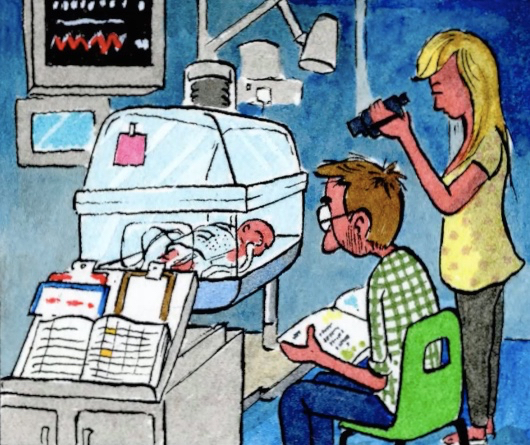 Father's Days, an animated memoir by British cartoonist Bob Moran, is NSFW (Not Safe For Work). Because if you are the parent of a child who has been in the NICU or a parent of a child who had a stroke at birth and/or who has cerebral palsy, you might get pretty worked up. Moran is the political cartoonist for the Saturday and Sunday Telegraph. His daughter suffered Hypoxic Ischemic Encephalopathy at birth, brain damage that occurs when a newborn's brain doesn't receive sufficient oxygen and blood. 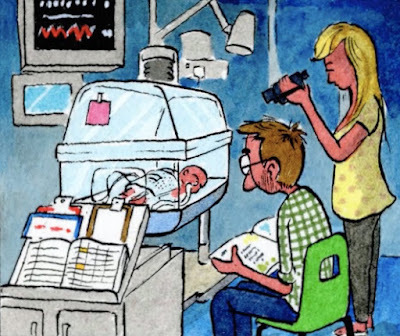 His cartoons capture the heartache, grief, helplessness, stress and bewilderment of what ensues, from the feeling of the parenthood you'd envisioned slipping away to the weird silence that greets you when you bring your baby home. You are all alone to watch over him or her, with no beeping monitors. I can vividly recall the sound of that silence. It is particularly touching to hear this from the p.o.v. of a dad, who wanted to be strong and hero-like for his family. And then: Things get easier. You get into the swing of all the doctor and therapy appointments. Maybe there are more challenges to come. But, then, you have changed as a person—as Moran did, as we all did—and you can deal. That story, you know. I am currently considering self publishing a book targeted to tweens with disabilities with an importance message of self acceptance. I can only hope it someday touches as many people as this story obviously did.